The Company of Proprietors of the Stroudwater Navigation is a remarkable survivor and is thought to be the oldest surviving canal company in the private sector. The Company can trace its roots backs to the 1730s when the first attempt was made to form a navigation between Stroud and the River Severn. 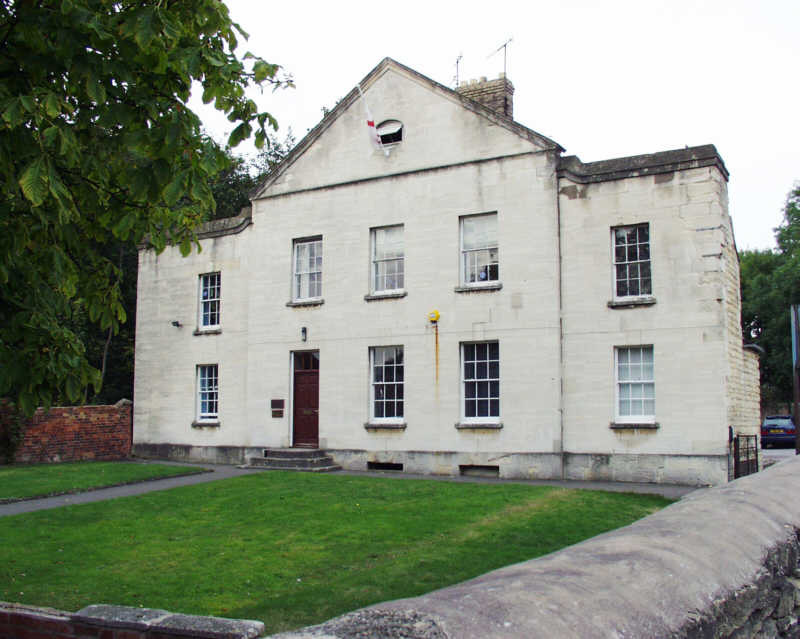 The c.1780 Company ex-Headquarters building in Stroud. The current canal is the third attempt and more or less avoids the River Stroudwater (or Frome). The earlier ones used the river and one of these tried to resolve the conflict of interest with the millers over water rights by using containers which were craned over the mill weirs. This is probably the first documented transport system which used containerisation - unfortunately early 18th century technology was not up to the job and it failed. The Stroudwater Canal as it is seen today was opened in 1779 and had a very long and prosperous existence. Traffic continued into the early 1940s but thereafter ceased. The Company was concerned about its liability for the maintenance of a number of road crossings and sought an act of abandonment to relieve itself of these obligations. By this time, there were sufficient enthusiasts with a vision for the canals to have a recreational role to oppose the abandonment proposals. A number of them tried to buy up shares in order to change the direction of the Company. For reasons that are still a mystery, others also started to buy shares to prevent the canal being saved and the fight was taken into Parliament. The Abandonment Act was passed in 1954 and the canal suffered a great deal of damage in the 20 years that followed with the Canal Company doing very little to stop it. The formation of the Stroudwater Canal Society in 1972 (later to expand and become the Cotswold Canals Trust ) started the change of attitude both within the Canal Company and the wider community. The attitude has changed from outright hostility to strong support and restoration work on the canal has brought some lengths back into use. The Company still own most of the canal route and has reacquired some lengths which were sold off in the less enlightened era and in April 2005 the canal was leased to British Waterways who were preparing to fully restore it. Due to financial pressures, BW decided to pull out of the project in early 2008 but the project for which funding had been secured continues with Stroud District Council taking on the role of lead partner for this part of the work. Part of the transfer process saw the formation of the Stroud Valleys Canal Company which has taken over the lease from BW and which now also owns the western section of the T&S Canal. The Company will continue to safeguard the future of the canal and be involved in its management through the Cotswold Canals Partnership and its involvement in the Stroud Valleys Canal Company which is controlled by Gloucestershire County Council, Stroud District Council, the Cotswold Canals Trust and the Company of Proprietors of the Stroudwater Navigation. The waterway between the rivers Thames and Severn consists of two canals which meet end on in Stroud. The first to open was the Stroudwater Canal which was build between 1775 and 1779 but was itself the third in a series of attempts to link the woolen mills of Stroud to the River Severn. It is a broad canal designed to take Severn Trow of up to 68ft in length and a beam of 15 ft. These craft could carry cargos of up to 100 tons. The Thames & Severn Canal was built between 1783 and 1789 and was a much greater engineering feat as it climbed to Sapperton Tunnel which pierced the Cotswold Scarp. The tunnel was the longest built at the time of construction but was also of one of the largest in cross section. The completion of the T&S Canal provided the first inland waterway route between London and the Midlands but the poor state of the Thames navigation upstream of Oxford was to greatly limit the success of the through route. The opening of the Kennet and Avon Canal captured most of the Bristol trade and the coming of the railways in the mid 1840s started a slow decline in trade from which the canals would never recover. The summit level of the T&S Canal always required careful maintenance and water supplies from the River Churn in Cirencester needed to be supplemented by pumping at Thames Head using a beam engine. As trade declined in the late 19th century, the water levels on the summit were frequently allowed to drop to levels which caused navigation to become impossible. The T&S Canal's plight became worse when control of the canal company fell into the hands of the Great Western Railway who, in the 1890s, sought to close the eastern part of the canal. A Trust was formed to restore the canal but this ran out of money and Gloucestershire County Council took over. The GCC did reopen the canal at the turn of the century but the levels of trade were insufficient to justify maintenance costs and the last boat traversed the whole canal in 1911. The canal east of Chalford was abandoned in 1927 and the rest in 1933. The Stroudwater Navigation did not suffer the high maintenance costs of its younger brother and successfully captured a considerable amount of local trade, mainly supplying coal to the many mills in the Stroud Valley. However, commercial traffic ceased in WW2 and the canal was formally closed in 1954 although The Company of Proprietors of the Stroudwater Navigation , its owners, continued to exist. Both the T&S Canal and the Stroudwater Navigation are the subject of restoration proposals. The Cotswold Canals Trust has spear headed the campaign for 40 years and a breakthrough means that the project to fully restore these canals is being backed by the Cotswold Canals Partnership, whose members include the Environment Agency, Natural England and all the Local Authorities along the whole route. The initial phase of substantial restoration, Phase 1A, has cost about £20m to fully restore the length between Stonehouse and Hope Mill near Brimscombe. Plans are advancing to fully redevelop Brimscombe Port. This 6 mile length is arguably the most difficult in the whole 36 mile route. Various other sections and structures of the canal have been restored with some to full navigation including some of the flight of locks at Eastington. The current challenge is to restore the 4 mile long Phase 1B length needed to connect Phase 1A to the rest of the national inland waterway network at Saul Junction. This is also expected to cost about £20 million. Progress on other sections of the rest are also taking place and it is hoped that these will accelerate as more of the canal re-opens.